Yachts for Charter: Which Charter Yachts are Best for Your Vacation? Which Charter Yachts would be the best fit for your vacation? Whether motor yachts such as, large mega yachts and medium-size luxury yachts or classic sailing yachts and all-in-inclusive catamaran yachts. Whatever your style or budget we can help you find the best and perfect private charter yacht for your vacation. Here are some of the finest yachts for charter. Peruse these awesome charter yachts for destinations like, Caribbean, Bahamas, Meditterraenean, and many other worldwide coasts, tropical islands, and places you can only reach by boat. Charter mega yachts range from 125 Ft. to 300+ Ft. and offer the epitome of opulance while you enjoy impeccable service and ultimate relaxation. Luxury charter yachts range from 65 Ft. to 124 Ft. and vary greatly in style, speed and amenities. Luxury yachts also include, sport yachts, and sport fishing yachts. Real sailors will enjoy these choice mono-hull sailing charter yachts. Larger sailing yachts combine luxury amenities with the added benefit of world-class sailing performance. Catamaran yachts multi-hull design offer more spacious interior and deck areas and a more stable ride under sail than sailing yachts of similar lengths. 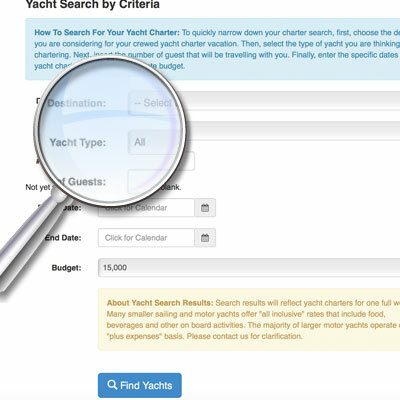 What's it like renting charter yachts with MGMYachts? We are a licensed and insured international luxury yacht charter agency. Why is that important to you? Well, as independent professional yacht charter brokers we are qualified to represent your interests when chartering any type of yacht for any duration. We are not beholden to any particular fleets or yachts, we have only your best interests in mind. We have been in the yacht charter industry for more than 25 years and are proud members of CYBA and FYBA, internationally recognized yacht charter associations. We have access to all charter yachts worldwide, we regularly inspect yachts and interview the crews, and most importantly, we are able to provide you with a completely honest and unbiased analysis of all the yacht charter options available that suit your travel style, taste and budget. Whether you are new to yachting and this is your first yacht charter vacation or you're a seasoned charter yacht connoisseur – Our yacht charter specialists' wealth of knowledge and discerning eye for important details means your unique preferences will be perfectly matched to the right yacht and destination - assuring you a superb yacht charter experience with unforgettable moments. Thinking of Chartering for the first time? Learn about yacht chartering in the Yacht Charter Guide. Search our databases of more than 1000 crewed charter yachts worldwide and preview online charter yacht brochures. 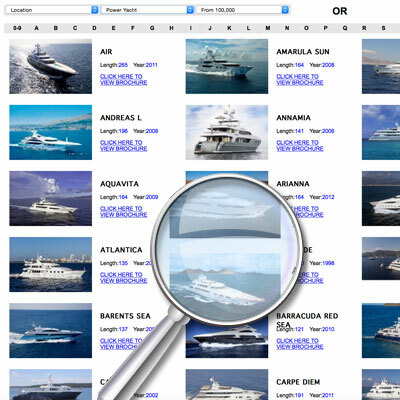 Click on the image below to use this easy Yacht Search Tool. Enter your basic yacht vacation search options in the fields to see a selection of fully crewed charter yachts that meet your criteria. In addition to interior and exterior photographs of each yacht, you'll also find yacht specifications, crew profiles and in some cases even a sample of the chef's menu. Feel free to email us with any additional questions you have. We are constantly inspecting yachts in person all over the world so we can better serve you. This database is just a sampling of yachts avallable worldwide. There are many more wonderful charter yachts we can offer that are not listed here. Contact us and we will email you a hand-picked selection of yachts best suited to your style and budget.